Hutterites have traditionally valued music and songs which acts as important method of binding Hutterite faith, history and culture together. Singing evening on Hutterite colony. Historically Hutterites of old, such as Hans Reifer, Peter Riedemann, Paul Glock, Wolf Sailer and others wrote hundreds of songs ranging in subject from historical accounts to Biblical stories to God’s Grace. Most of these traditional German songs are still extant, published in our Väterlieder songbooks, and many are still sung by Hutterites today during church services. Typically these songs are sung a capella during church services and rarely are they harmonized. Besides the traditional songs, Hutterites love to sing other types of songs. Within the last 20 to 30 years, there has been a greater emphasis within many Hutterite colonies to sing in choirs with full part harmony. These choirs made up of young unmarried men and women over the age of 15, sing for various audiences at weddings, religious holidays and at other special events. The Prairie Praise Choir under the direction of Kenny Wollman followed a similar pattern but it’s comprised of multiple colonies from eastern Manitoba. 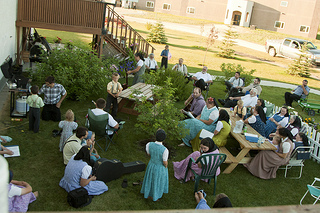 In addition to choir singing, Hutterites enjoy singing in small groups and as individuals. Although musical instruments are officially taboo in many colonies, small pockets of fervent musicians continue to make music, some privately, others less so, in many colonies throughout North America. Some Hutterite leaders strongly encourage all kinds of singing as long as the content of the songs is appropriate and glory is given to God.